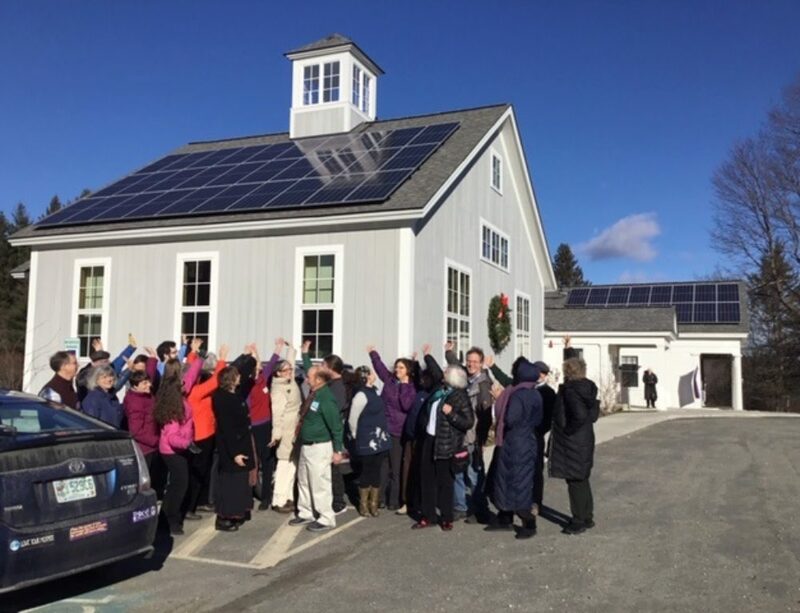 Windsor, VT — Four of the five proposed solar array projects in town received unanimous support from the Selectboard this week while fifth site near Juniper Hill and County Road was approved, 3-2. Town Manager Tom Marsh said the board vote Tuesday night for the Juniper Hill location comes with a condition that the developer, Norwich Solar Technologies, connect to the grid using an existing transmission line along Juniper Hill and then construct a new line on an access line to the array. Joel Stettenheim, Norwich Solar Technologies president and co-founder, said although the board’s recommended route is longer and more costly than “cutting a new swath” to the array, as had been proposed, his company is agreeable to taking the longer route after hearing concerns from abutters at Tuesday’s meeting. “There is less of an impact on abutters using Juniper Hill,” Stettenheim said on Wednesday. He welcomed the review of the project with input from residents. “We appreciate the opportunity to work with the town and Selectboard. We think this is a great opportunity to bring green energy on to the grid,” Stettenheim said. The letters of support designate each location as a “preferred site” under the state’s solar siting legislation, Act 174. Local backing of solar projects is considered an important piece toward obtaining a certificate of public good from the state Public Utilities Commission. The other three projects by Norwich Solar Technologies of White River Junction are on the property that was previously home to Cone Blanchard Machine Company and mostly recently Seldon Technologies in what is now called the Windsor Technology Park. 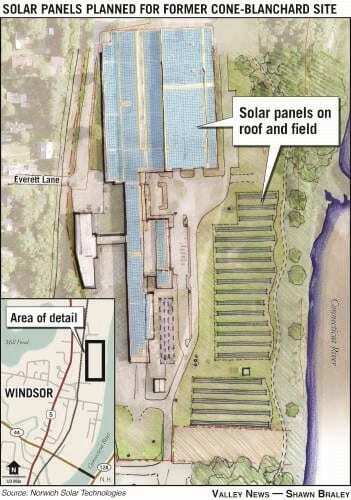 One array of 1,200KW would be on the roof of the large building in the park and a second group of solar panels of 500KWs would be constructed on a field between the access road and Connecticut River. The third array of 150KWs is planned for the northern end of the property where Coolidge Drive ends. Marsh said there are old foundations and other materials at that location. At the southern end of town, The Green Lantern Group is proposing to build a 500KW array on a 3.5 acre parcel off of Back Mountain Road, near where it crosses over Interstate 91. The property is owned by Miller Construction and is accessible from both Route 5 and Back Mountain Road. “This was really an essential step,” said Ralph Meima, director of project development at Green Lantern, about the board’s letter of support. Meima said interconnection with the grid has been approved and they are also addressing other aspects of 174 including visual impacts of the array. The Juniper Hill array of 500KWs would be on about 5 acres of a 100-acre parcel, Stettenheim said. All five projects have also received the support of the town Planning Commission. Tom Kennedy, executive director of the Southern Windsor Regional Planning Commission, said they were waiting for the town to decide its position and now that it has, the commission will consider whether to support the projects at its meeting on Monday. Under 174 a preferred site usually has no greater and better use (than a solar array) and would not be designated as such if it were prime agricultural soil, known for wildlife habitat or used for recreation.